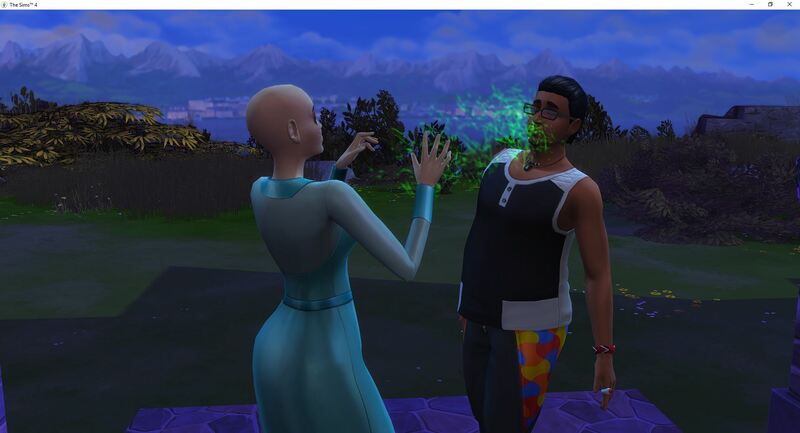 Desire makes her wish and she is promised a promotion so once she goes back to work that will complete the careers required for the challenge. 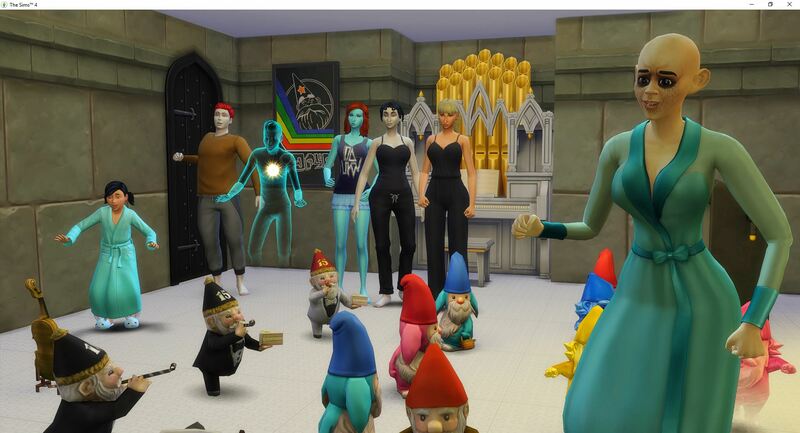 But first it is Winterfest. 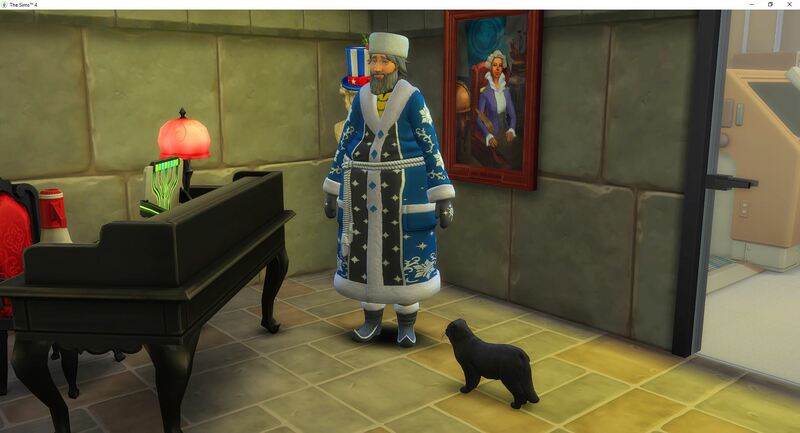 This is not the current Father Winter (I don’t think). This is Vanity’s go-to meal. She will need to feed and he is here to hopefully save Venom from being the target. 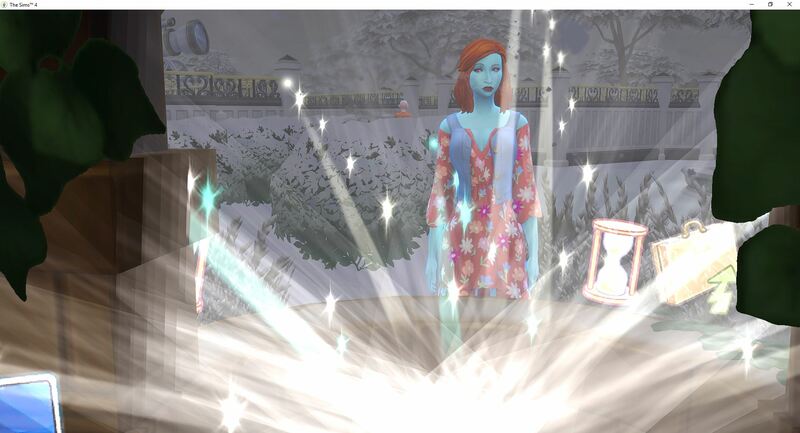 Venom is saved for another day as Vanity is able to catch Father Winter before he decides to leave for the night. 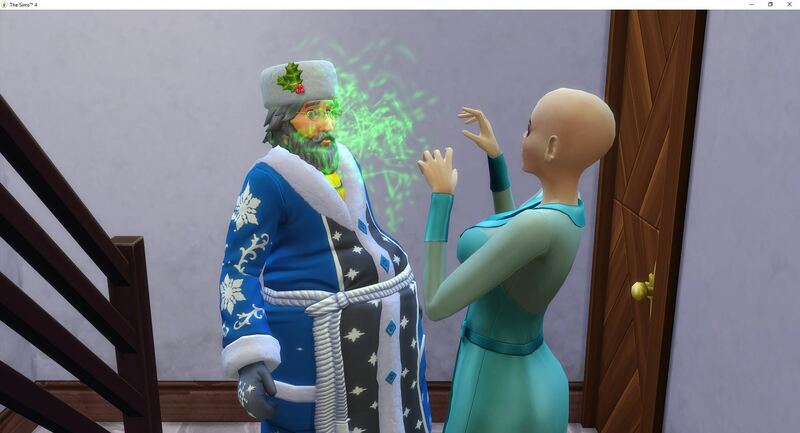 After feeding on Father Winter, it is time for Winterfest. 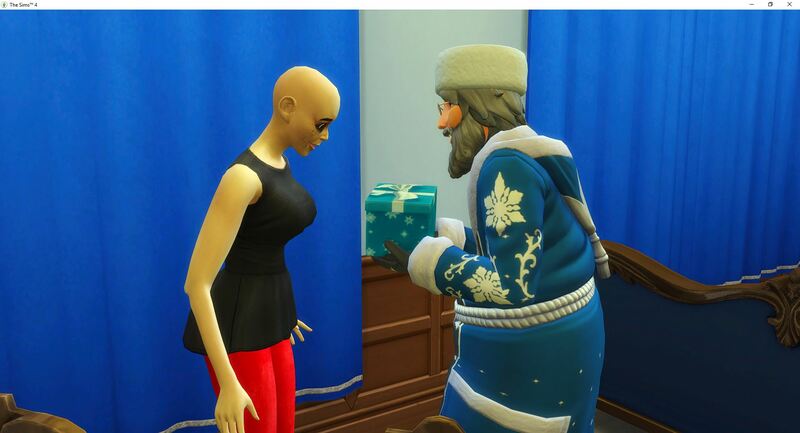 It turns out this is the real Father Winter because Vanity has the option to ask him for a present. He gives her nothing but sadness and lies. No rest for the weary, so Voracity is woken up and set to work following Larceny around for awhile. 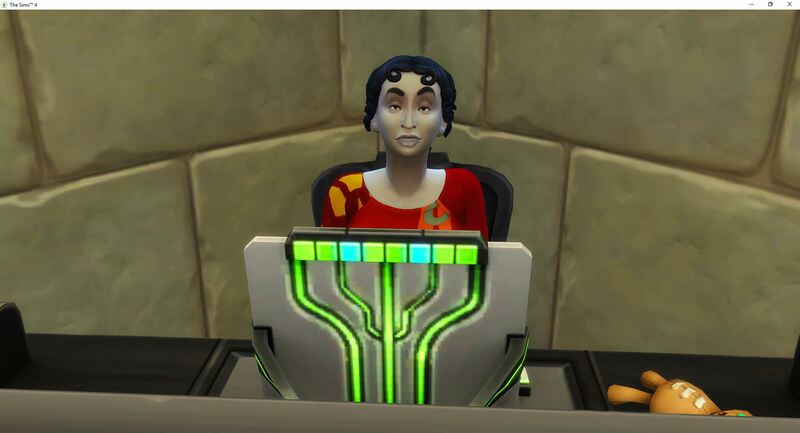 She does manage to get thinking to level 4 before she loses her happy and has to go back to bed. This is some time the next day. 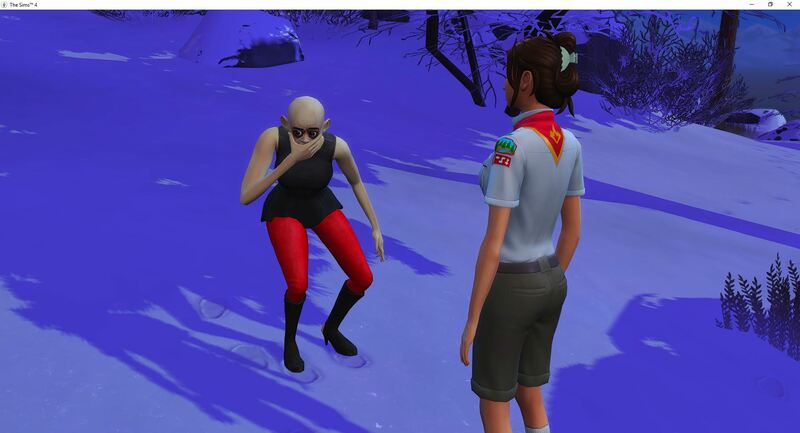 Then I remember it is Winterfest and, well it was Winterfest. 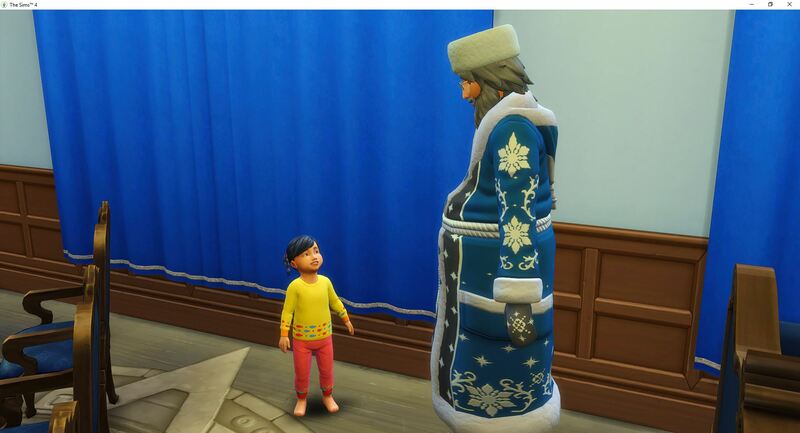 There was a new Father Winter but no one talked to him and now it is too late because he is leaving now. But that is okay because everyone had a successful holiday after all. 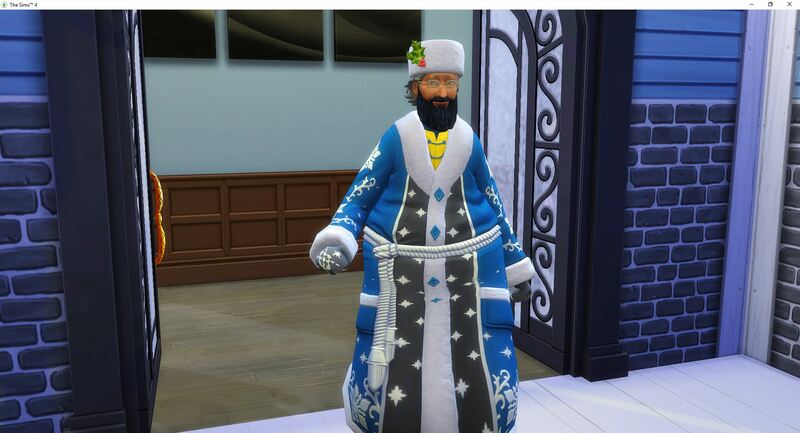 Yes, I totally missed Father Winter, but throughout the day, they opened gifts a few times, and even sneaked a few gifts. 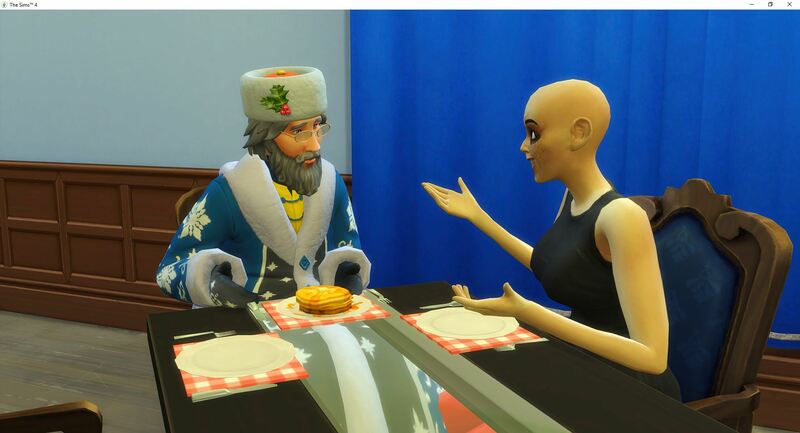 But I never saw Father Winter until he was leaving. 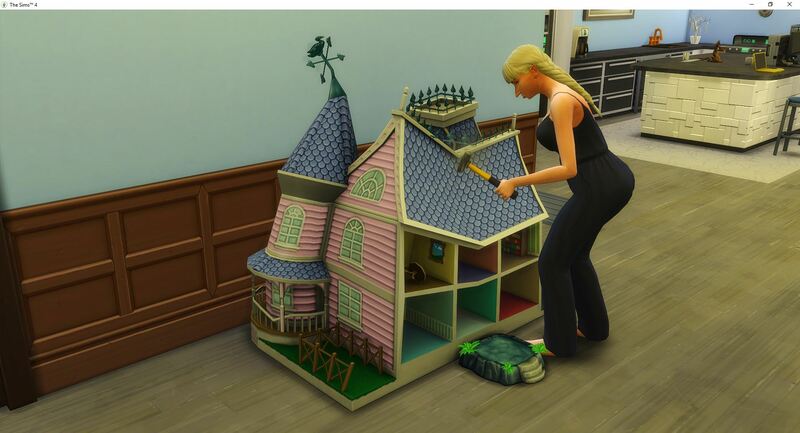 Malice makes sure there is dollhouse destruction and then she repairs it before Voracity comes running through for food. While Voracity is eating she peppers Malice with questions why. Venom makes the mistake of wandering through and he also has to answer a series of questions, but eventually thinking is mastered and they stop listening. While Voracity is learning to think, Desire comes home with a promotion to Supreme Villain, and completes the last of the careers. 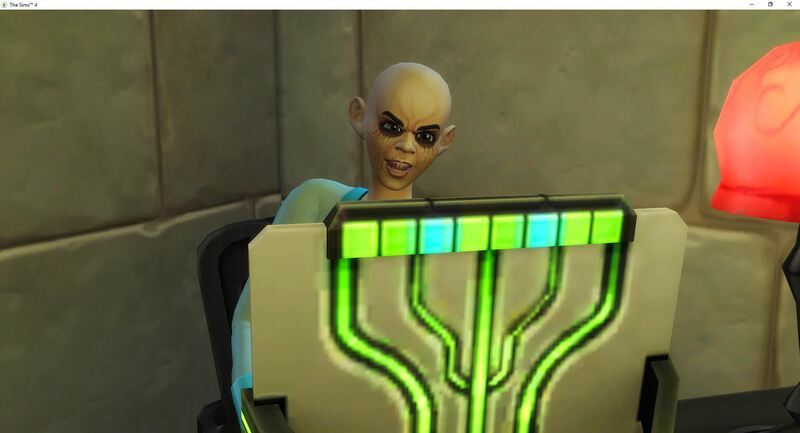 This is the look as Voracity finally reaches level 5 in thinking. Malice has been broken. 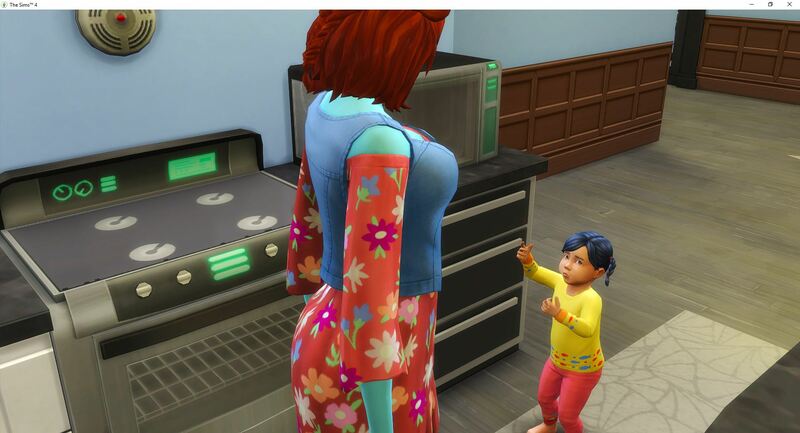 With just imagination remaining, stories are fed to Voracity until she is finally a top-notch toddler. And just in time because tomorrow is her birthday. 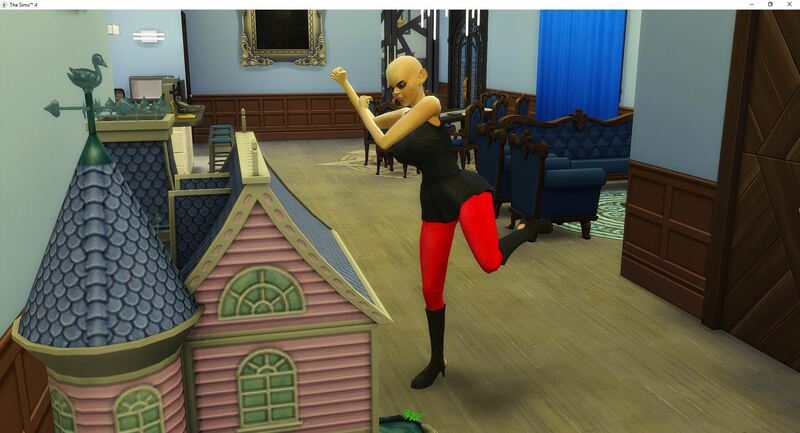 Voracity spends the entire day of her birthday doing anything she wants. 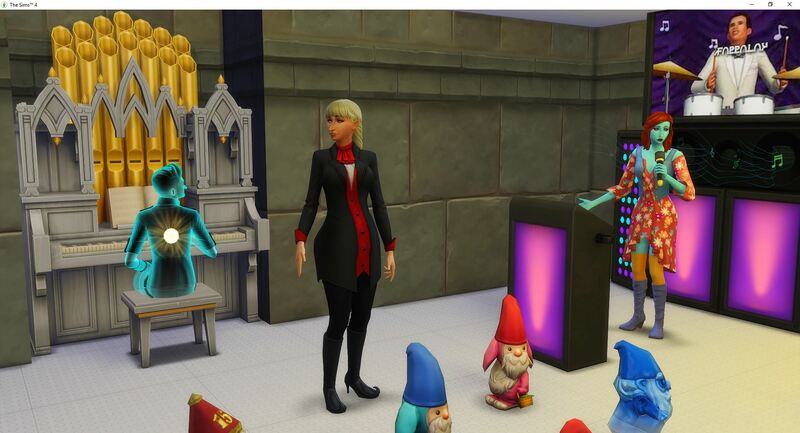 She even “watches TV” with the gnomes. I don’t know what they are watching since the TV isn’t on, but she is watching it. 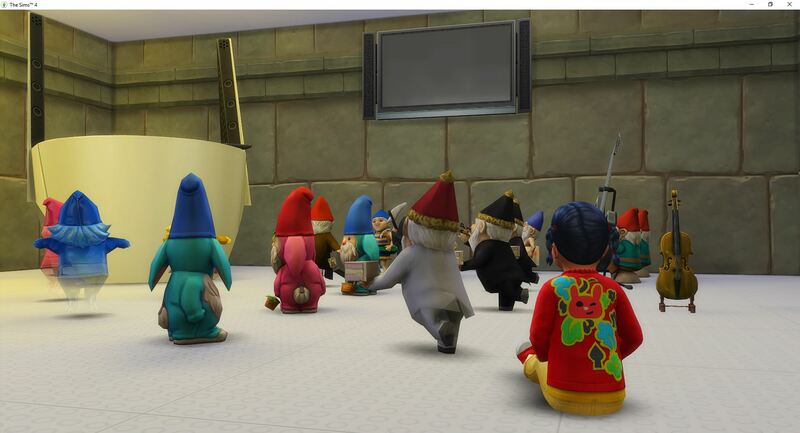 While Voracity takes a nap, there is a group meditation session taking place also as everyone recharges their batteries. 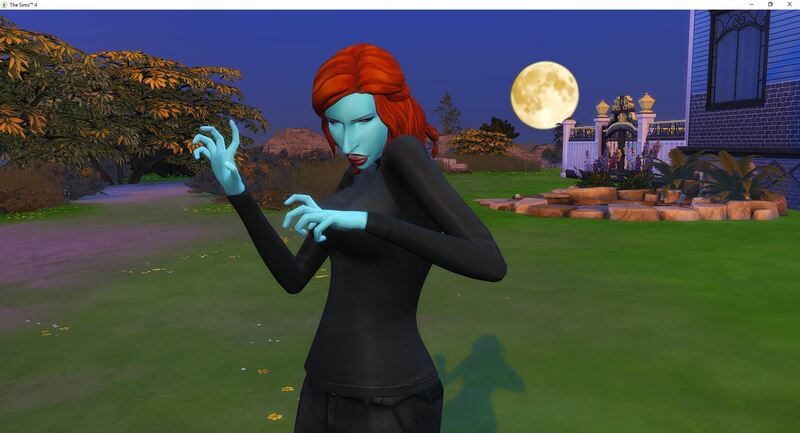 Vanity comes home from work and she is stalking her prey. It takes a little maneuvering but she is eventually positioned correctly and has some dinner. 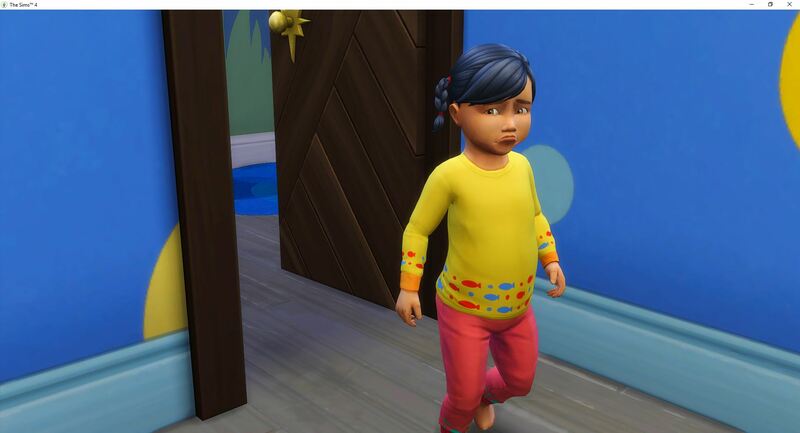 Voracity wakes up from her nap to realize it is nighttime and she is still a toddler. What happened to her birthday – did everyone forget about her? 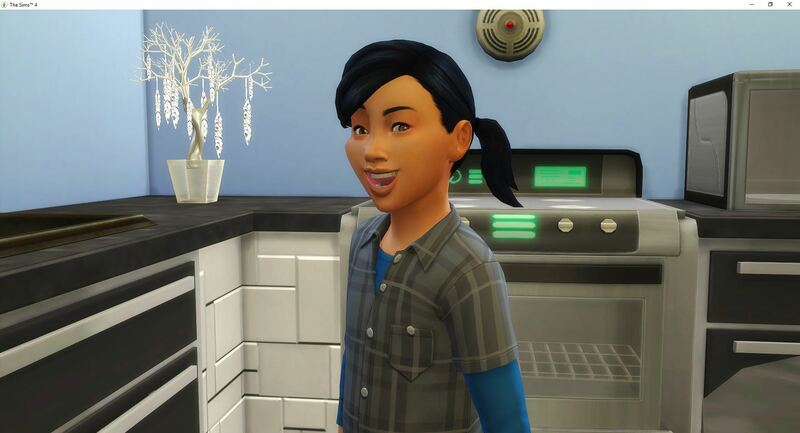 Voracity goes to potty and then goes into the kitchen to find Desire and complain about her birthday. 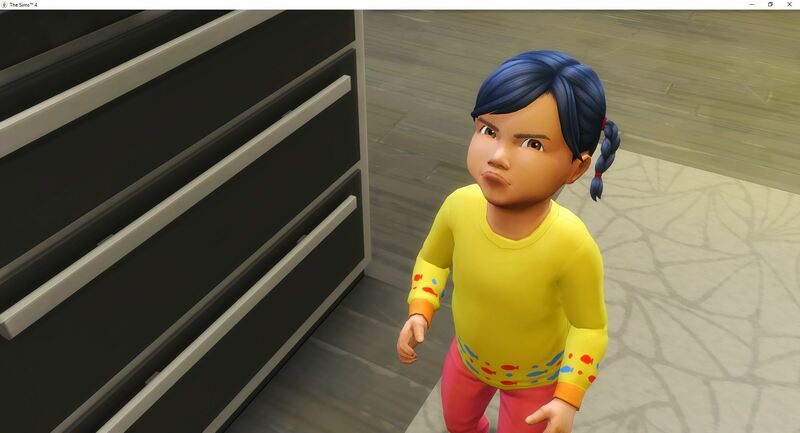 She tells Desire how sad she is that everyone forgot her birthday and is making her stay a little toddler forever. She was supposed to have a birthday cake and get bigger today. 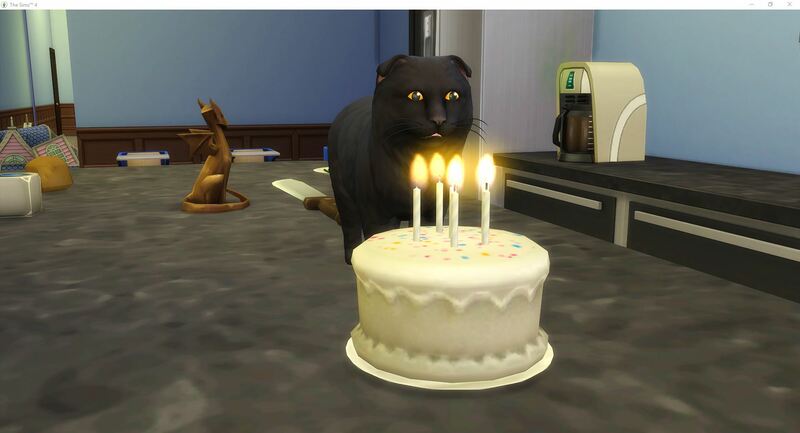 Raven is taking advantage of the distractions to sneak into the cake that Voracity hasn’t seen yet. 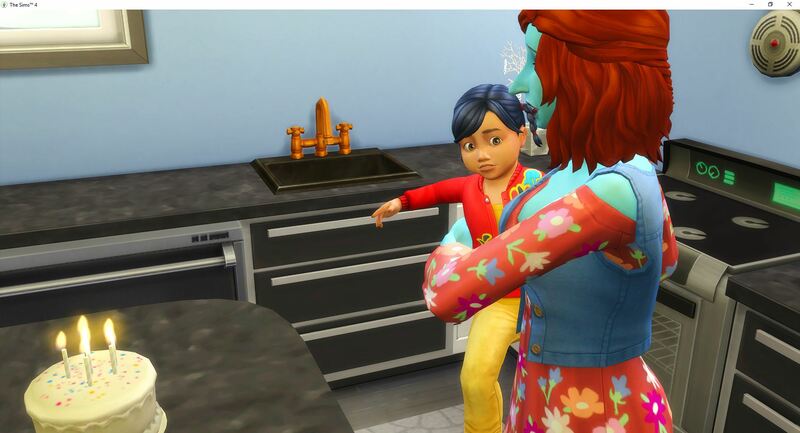 Finally, Desire gets Voracity changed and shows her the cake and it is time for the last toddler to become the last child. The independent (pita) toddler is now an evil child. Oh joy to world. The focus is all on Voracity now. As a child she only has to complete Whiz Kid. That is it – 12 days. Everyone else in the household has completed their tasks. 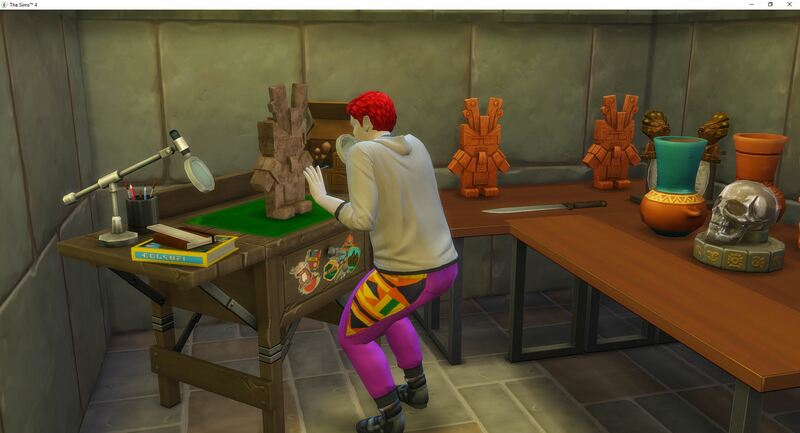 Oh, and Venom is still trying to finish authenticating the last of the artifacts. 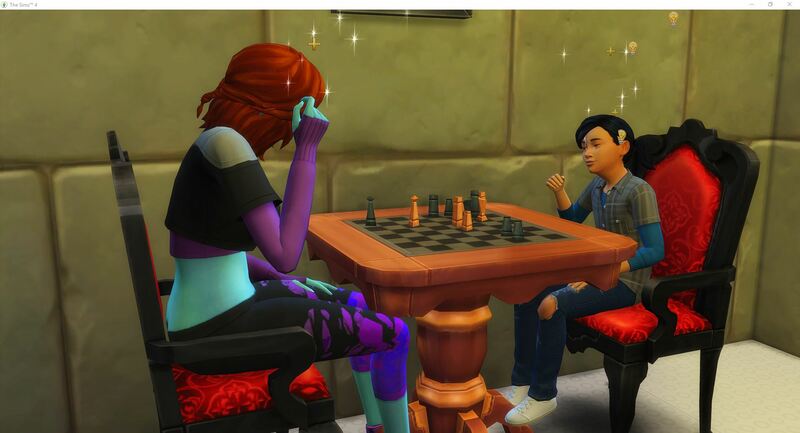 Paying attention for the first time this challenge (ever), Voracity waited to do her first homework until after she played chess three times so that she could get credit for completing it while focused. Now she needs to raise her mental skill and complete her homework one more time while focused. But first let’s take a timeout for New Year’s Eve. Everyone made the same resolution – to write a book. Then they immediately began writing a children’s book because they didn’t have any writing skill. Avarice wrote hers tipsy, so that one will be interesting to read. Venom has finally made it to the last artifact. 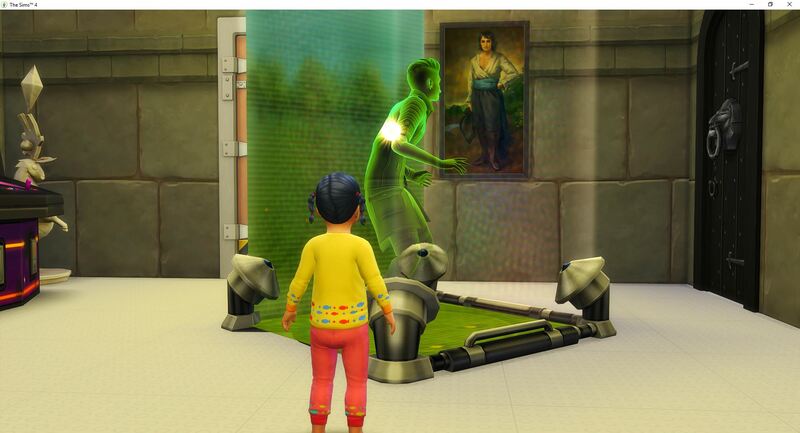 This should also mean the museum is complete except for Voracity’s portraits which will be added when she becomes a teen. The family decides to use the TV in the music room for New Year’s Eve this year. They don’t need anything to sit on. 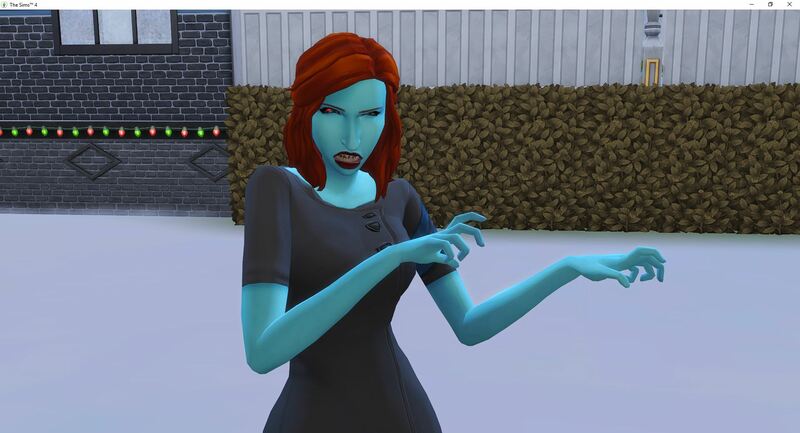 Voracity hasn’t had her makeover yet (obviously) and she doesn’t care (obviously). She is blowing and going on the mental skill. While Larceny was writing his book for his resolution I was playing with his options and had him write an excuse for Voracity. 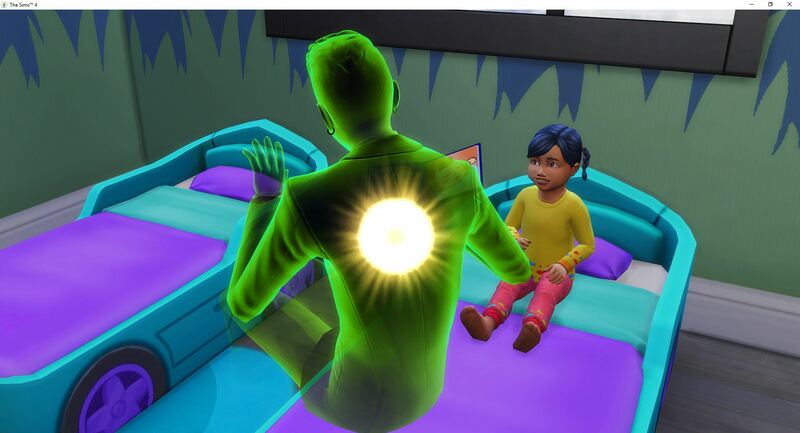 I never did one of those before and didn’t realize it would actually put her on a sick day from school automatically. 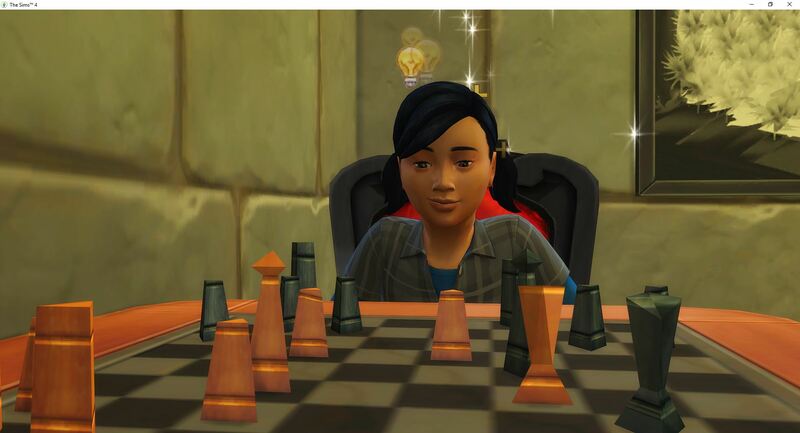 So she is on a sick day and is chained to the chess table until she maxes mental. Because the challenge ends when she becomes young adult, she doesn’t have to plan for any future life. Her child life is strictly for the Whiz Kid aspiration. At this point everyone is just doing their own thing, and I catch these three in the music room hanging out. 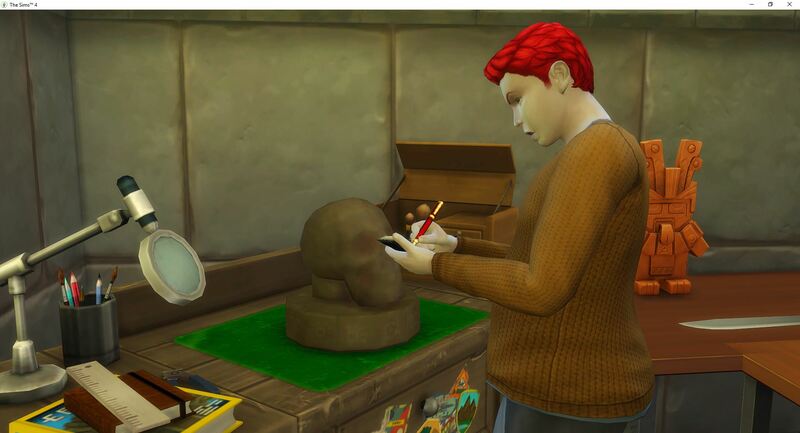 Larceny has come in here every so often as he is basically the only creative sim in the family. Desire has sneaked in once or twice to toy with the karaoke. 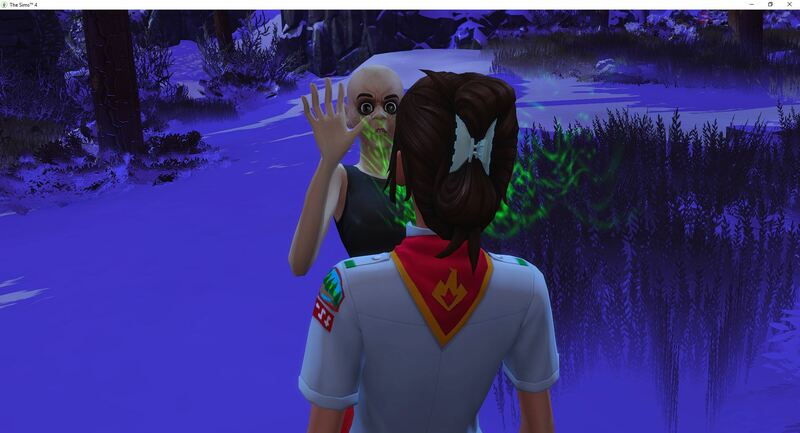 Malice looks like she took a wrong turn. Vanity wound up for this one and gave it a really hard kick. She is about to go loco for some O negative. Voracity has mastered the mental skill and is now waiting to go to school so that she can move along the mental aspiration. Stupid note. 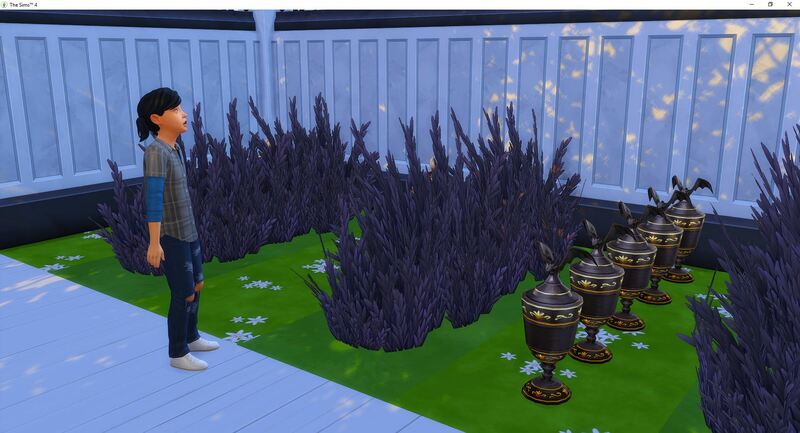 She is mourning for Augustus. 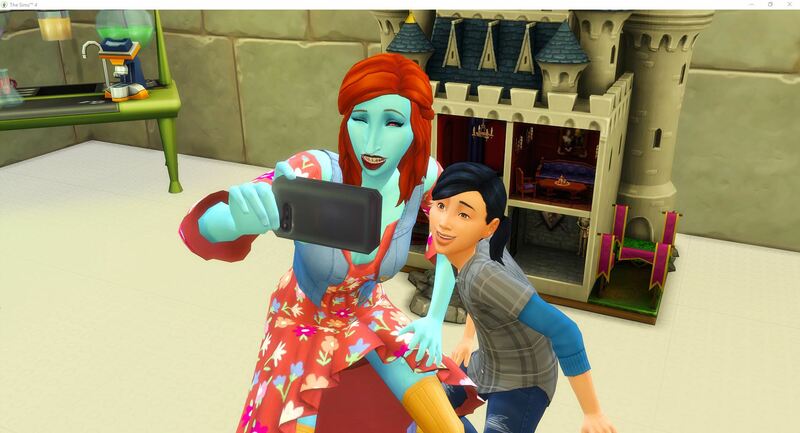 Still someone she has never met, but at least he is the most recent ghost. Touring the cemetery, she is mourning more than just Augustus. On her way back to the house, I was checking her actions to see what she could do. 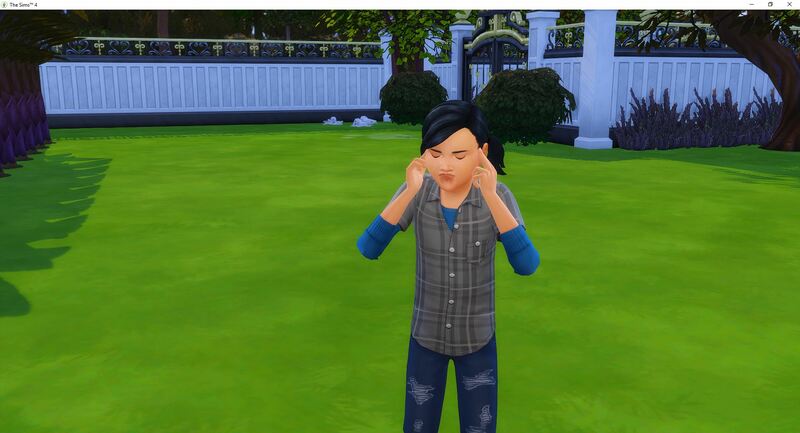 I was looking for something (can’t remember what) and noticed she had the option to try mental telepathy. 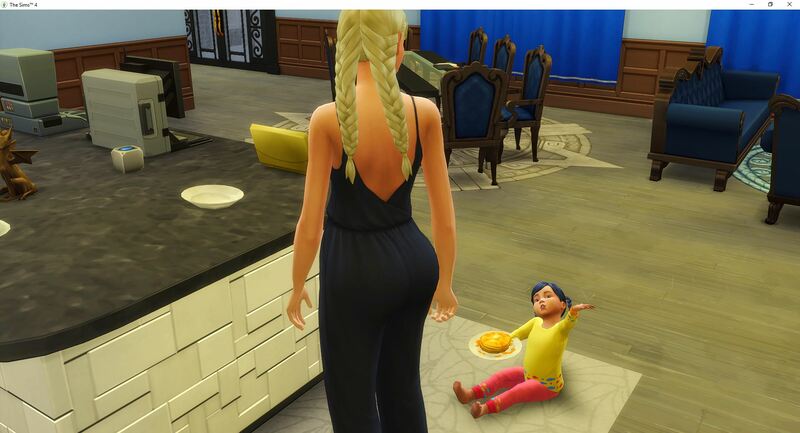 She tried, she failed. But she is really focused now. Desire catches her in the playroom and they take a moment to get a picture together. 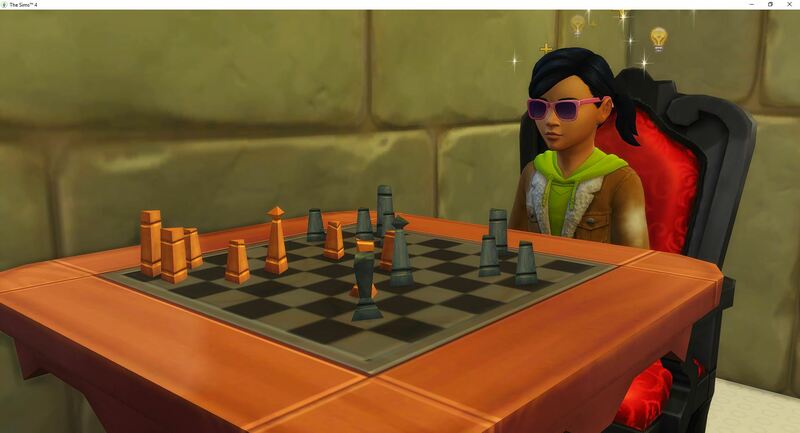 Vanity gets on the forums and begins trolling them, reminding everyone that she is controlling the town. She controls everything. 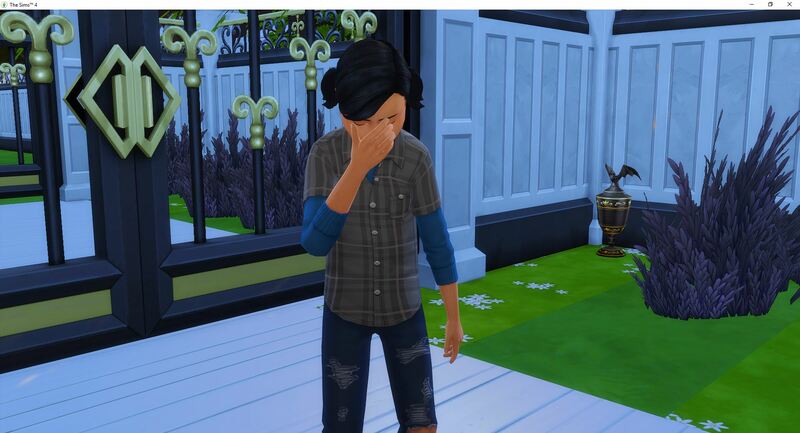 Kale invites himself over and Vanity doesn’t object to the dinner delivery. 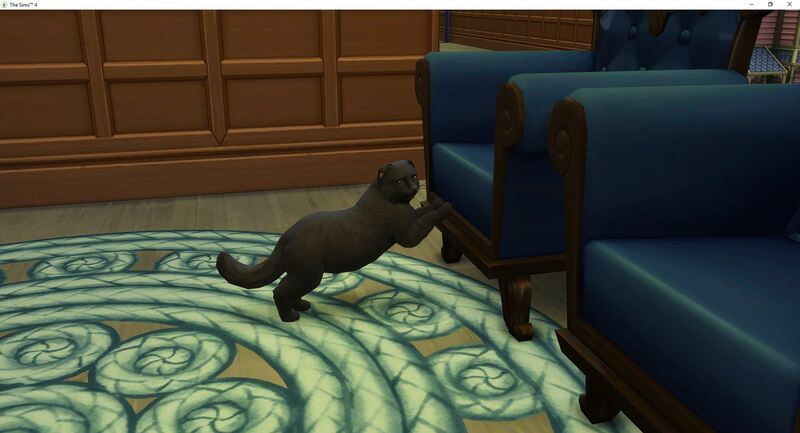 Raven is still destroying the furniture one piece at a time. Voracity comes home just short of earning a B. She is tense from studying hard – cheating didn’t work. 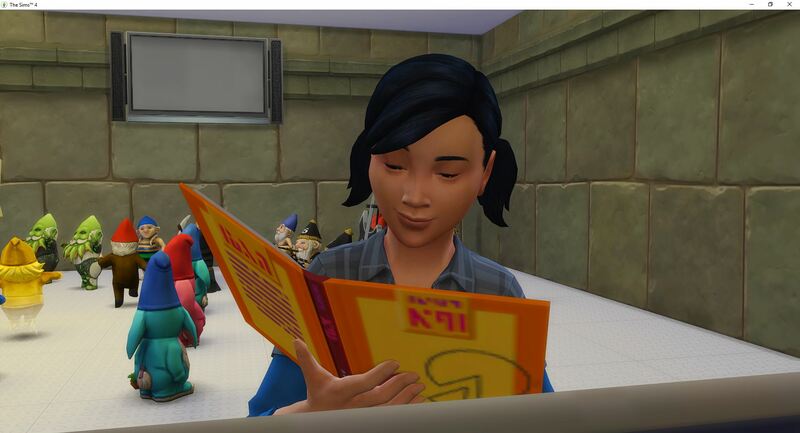 But she gets through her homework quickly and she is almost done with her aspiration. 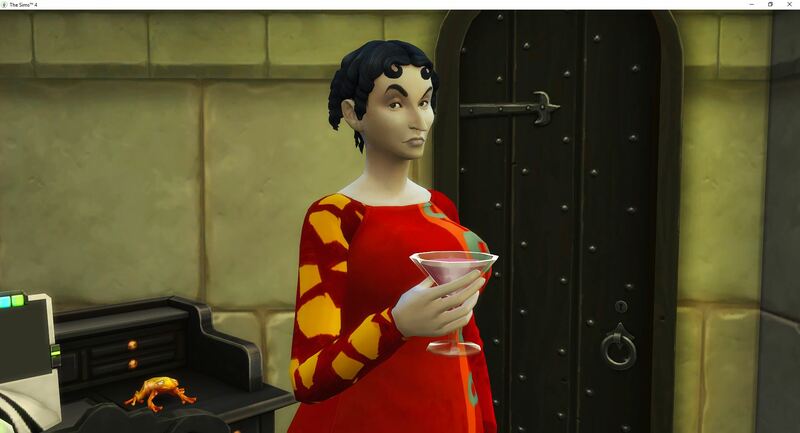 She quickly makes the three emotion potions and she heads up to bed. Tomorrow is another day. 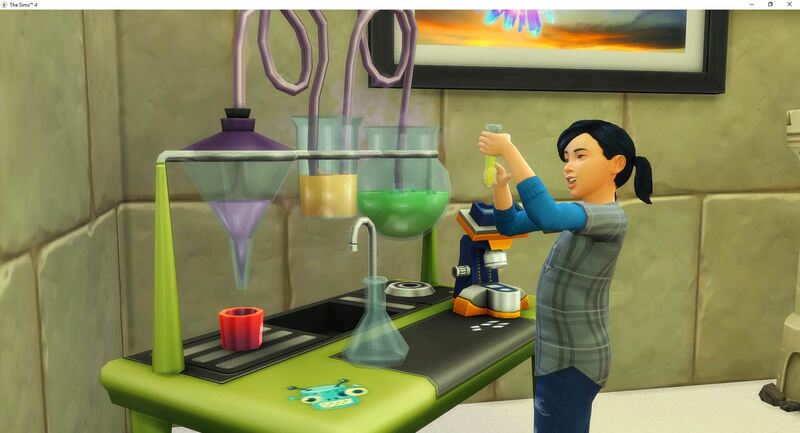 Secret Agent, Villain is the only career branch that has 11 levels (I forgot). 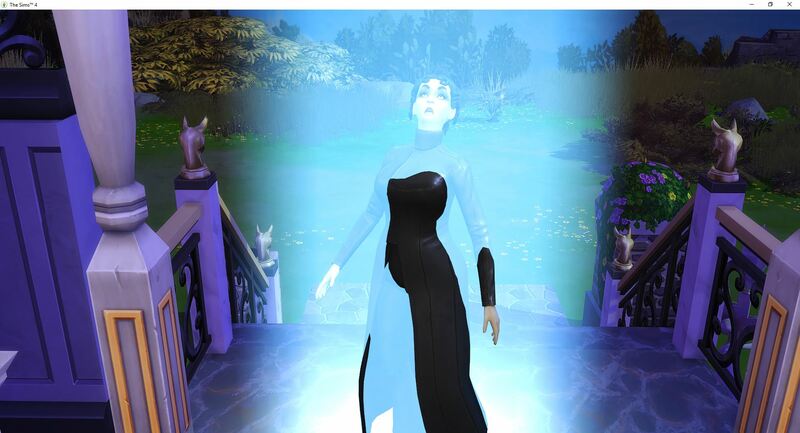 Desire just came home with the last promotion to level 11, Triple Agent. 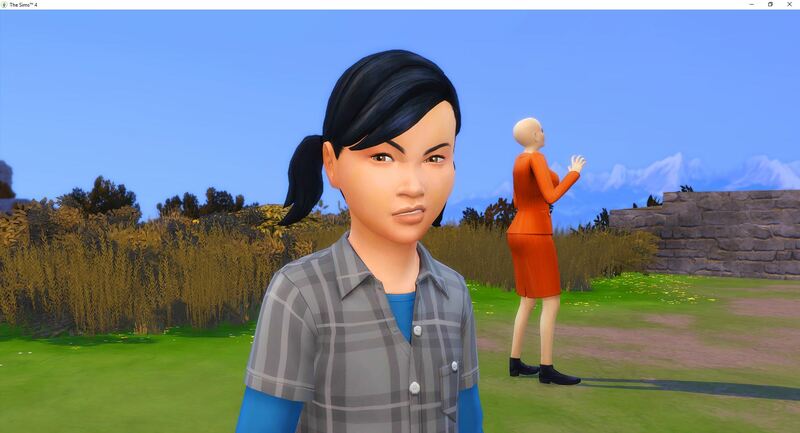 Although, I liked the title Supreme Villain better, she is now a Triple Agent which is probably better for the family that controls everything. 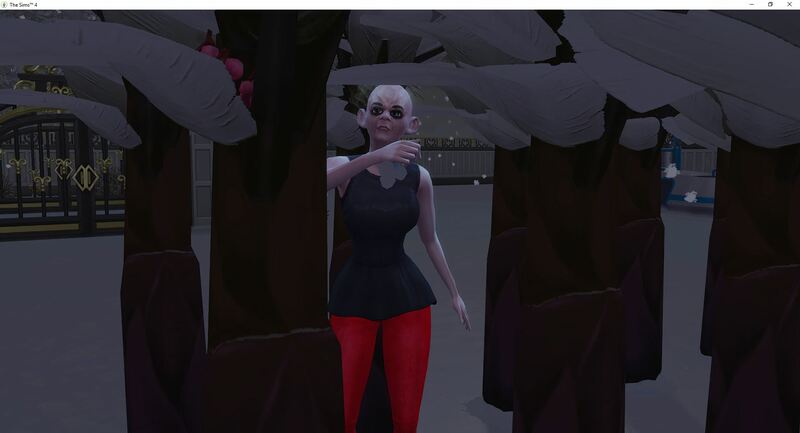 And she looks really cool in her new clothes. Damn – just couldn’t help it. There go more penalty points.